A simulation of the gas cloud G2's encounter with the supermassive black hole Sgr A*. The blue lines mark the orbits of the so-called "S" stars that are in close orbits around the black hole. 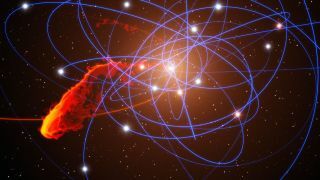 Scientists around the world are tracking a doomed cloud of gas as it makes a daring approach toward the monster black hole at the center of our Milky Way galaxy, a cosmic encounter that might reveal new secrets on how such supermassive black holes evolve. The G2 space cloud, and its ultimate death by black hole, have been under close scrutiny since the cloud's fate was first identified in 2011. Now, the cloud is destined to be shredded by a supermassive black hole. "We get to watch it unfolding in a human lifetime, which is very unusual and very exciting," said Haggard, a researcher at Northwestern University in Illinois, during a presentation this month at the American Physical Society in Savannah, Georgia. Gillessen is a researcher with the Max Planck Institute for Extraterrestrial Physics in Germany. The supermassive black hole at the center of the Milky Way is known as Sagittarius A* (pronounced "Sagittarius A-star" and known as Sgr A*). It is 4 million times as massive as the sun and visible only by its effects on the surrounding stars. In 2011, Gillessen and a team of astronomers found that a small gas cloud with a mass roughly three times that of Earth is on a collision course with the black hole in the Milky Way's core. Scientists quickly determined that the cloud would begin to interact with Sgr A* around the end of March 2014 — one month ago — and have been monitoring it continuously in various wavelengths. "There's a lot of action in a small space," Haggard said. Haggard serves as the principal investigator on a project that monitors the interaction using NASA's Chandra X-ray Observatory and the NRAO's Very Large Array, combining the X-ray and radio wavelengths to learn more about the days ahead. Gillessen keeps the European Southern Observatory's Very Large Telescope tuned to the heart of the Milky Way. "The object is being accelerated — it's getting faster and faster," Gillessen said. Already, parts of the cloud have begun to shift. Turbulence and the tidal forces of the black hole combine to mix up the gas cloud as it approaches the black hole. "It looks like a drop of milk in your morning coffee," Gillessen added. The front of the cloud has begun to move faster than the back as gravity affects the region closer to the black hole. Gillessen compared it to a train whose back was moving slower than the front—"not very healthy," he said. But while some wavelengths have begun to show the effects, G2 has remained silent in the X-ray regions observed by Chandra. "So far in the X-ray, there is no sign of the G2 interaction," Haggard said. "We're hoping that will change in time." Sgr A* itself hasn't been quiet; in 2013, NASA's Swift Gamma-Ray Burst mission detected the brightest flare ever observed from the black hole. According to Haggard, the flare is probably not connected to G2, but it's possible that as the gas cloud gets shredded, it could potentially give rise to similar flares, though from a greater distance. A proud lion or a growing child? As the gas cloud interacts with Sgr A*, Haggard expressed hope that it would help scientists to understand how black holes grow so large. While supermassive black holes can reach masses millions of times that of the average star, other black holes can pack a single stellar mass into a small space. Scientists know that supermassive black holes grow primarily by accreting stars, gas and dust, but they are uncertain as to how often the behemoths require feeding. Haggard describes three possibilities: A black hole might grow in fits and starts, like a lion on the savannah, eating and getting fat, then lazing about for days before hunting again. Or it might grow more like a child, steadily over time but ultimately tapering off; A third possibility is that it could grow like the national debt —"one of the few things I could think of that just grows and grows and grows and grows," she said. The last one can be ruled out from observational evidence; if black holes grew continuously, they would be far larger than any that have yet been seen. Observations of G2 may help scientists determine which of the other two possibilities could be correct. At three times the mass of the Earth, clouds like G2 would be insufficient to supersize a black hole. However, the cloud could provide insight into how often such interactions occur. As G2 is shredded, it could also provide some clues about the flickering that occurs at the heart of other galaxies, which could be caused by their consumption of similar clouds. Gillessen compared observing the collision to a soccer game. Most of the time, astronomy can be likened to listening to a penalty shot over the radio, but to experience the action in person is far more thrilling. "We don't get to design experiments very often in astrophysics. We are observers, not experimentalists," she said. "It's exciting to have something that feels more like an experiment."